Each February huge hammerheads aggregate off the coast of Bimini Island in the northern Bahamas. Generally shy, reclusive animals, the great hammers at Bimini have quickly become a new phenomenon in the shark diving world because of the numbers that show up and their willingness to closely approach divers. Join me on an adventure that you’ll never forget! Mixed in with the great hammerhead sharks we also see quite a few bull sharks and nurse sharks. The bulls are bold visitors to the hammerhead shark encounters but they are rarely aggressive. This is a great chance to get close up images of a shark with a notorious reputation. And … dive with reef sharks, blacknose sharks, and more at Triangle Rocks! If endless hammerheads, bull sharks and nurse sharks is not enough of a draw, we will also try to squeeze in a shark feed or two at Triangle Rocks and Gun Cay. Triangle Rocks is a coral reef that is home to a healthy population of Caribbean Ref Sharks, Blacknose Sharks and even Caribbean sharpnose sharks. Never heard of these species? That’s just one more reason why Bimini is so special and why its important to dive with a local Bimini operator that knows where to find every type of shark! After a hard day of diving, relax at the Bimini Big Game Club – your home away from home! Day 1 Arrive at Big Game Club (resort) on North Bimini Island, Bahamas. In the evening, meet your trip leader for a briefing about the days to come. Day 2-3 Around 9am, after a short 10 minute ride, you will arrive at our shallow great hammerhead spot where the crew will give a thorough briefing while we wait for the sharks to arrive. 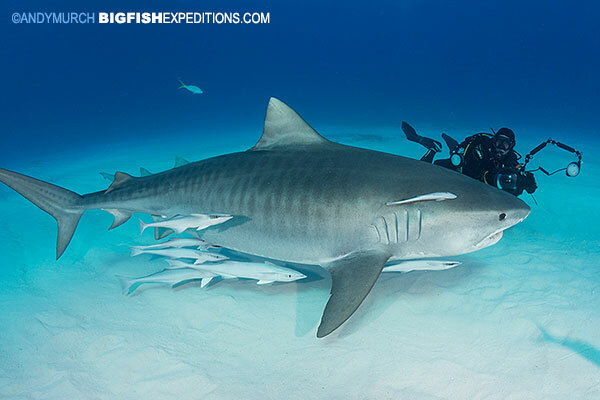 You can expect three dives with the hammerheads, plus you will likely see nurse sharks, bull sharks and maybe even a tiger shark. Day 4 Today we may head to Triangle Rocks – a nice reef with Caribbean Reef Sharks and Blacknose Sharks, then return to our hammerhead spot for two dives with the hammerheads. Day 5 Today we will head out later to our hammerhead diving area so that our final dive will start as the sun goes down. 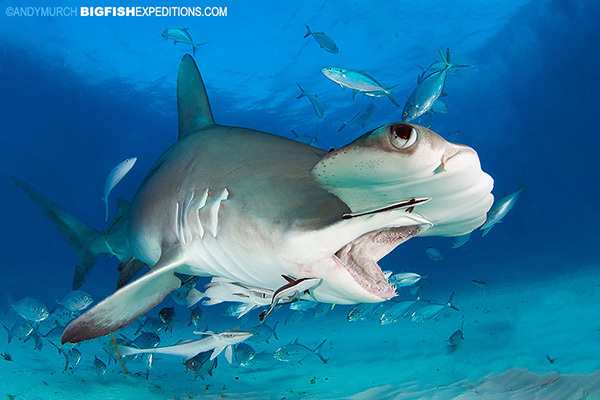 A night dive with large great hammerheads is a fun way to finish the day! Day 6 Our last morning of Great Hammerhead diving. In the afternoon if it is not too windy, we will head further offshore to snorkel with Atlantic Spotted Dolphins – a very friendly species that likes to play with divers. Day 7 After fond farewells, we will check out of Big Game Club for the journey home.